How to get here the fastest. Stadt-Galerie Hameln is located at Pferdemarkt in the heart of the historic old town. 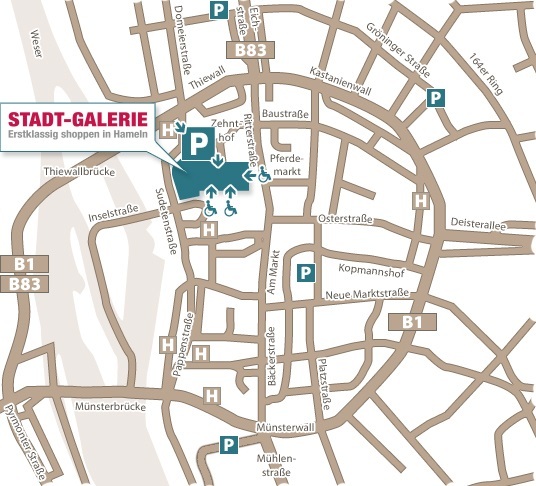 You can reach Stadt-Galerie via Hameln’s Innenstadtring road. Visitors coming by car can reach Stadt-Galerie via the B1, B217, and B83 roads. These roads lead directly onto the Hameln Innenstadtring road (see map). Turn off at the corner of Thiewall and Zehnthof and you will directly arrive at the entrance to Stadt-Galerie’s parking garage.